Toddy Haven, une escapade tranquille sur Toddy Pond, près de Bar Harbor / Acadia. Toddy Haven, une maison parfaite loin de la maison pour découvrir les merveilles du Maine. Un charmant cottage situé parmi les arbres à feuilles persistantes à seulement 100 pieds du rivage. Profitez de la cuisson d'une tarte au homard et aux bleuets du Maine dans une cuisine complète ou faites-la griller en plein air sur un gril à gaz tout en profitant du coucher de soleil sur l'étang. La salle à manger du chalet avec son plafond cathédrale et son ventilateur éclairé est un endroit confortable pour manger pendant que d’autres se rassemblent pour jouer à des jeux sur l’alcôve au bord du lac. Le salon est l'endroit idéal pour s'asseoir et se détendre après une journée d'aventure en Acadie ou de kayak juste au bord de l'étang, tout en regardant votre émission préférée sur un écran plat 55 "Chromecast 4K avec Sling TV. Écouter les appels du huard depuis le quai ou depuis le porche blindé procure une sensation de tranquillité à toute heure de la journée. Pour les soirées fraîches, une unité de chauffage au propane accueillera tout le chalet. Reposez-vous confortablement sur un nouveau lit king size dans la chambre au bord du lac. Il y a un lit superposé double / jumeau dans la deuxième chambre et un lit superposé jumeau dans le dortoir détaché. Il y a aussi une salle de bain avec douche. Le chalet a été rénové et est extrêmement propre. Un nouveau puits d'eau douce a été installé en 2016 pour votre commodité. Il n'est donc pas nécessaire de compter sur l'eau du lac. Une nouvelle installation septique a également été installée en 2017 et la plupart des aménagements intérieurs sont neufs. Les clients de nos deux cottages ont un accès privé au lac ainsi qu’aux kayaks. Toddy Haven est la maison idéale loin de chez vous pendant que vous découvrez les merveilles de la côte du Maine. Excellente pression d'eau et beaucoup d'eau chaude. Il y a également un dock fourni. My husband and I found this peaceful camp was just what we needed to recoup from our normal hectic pace. 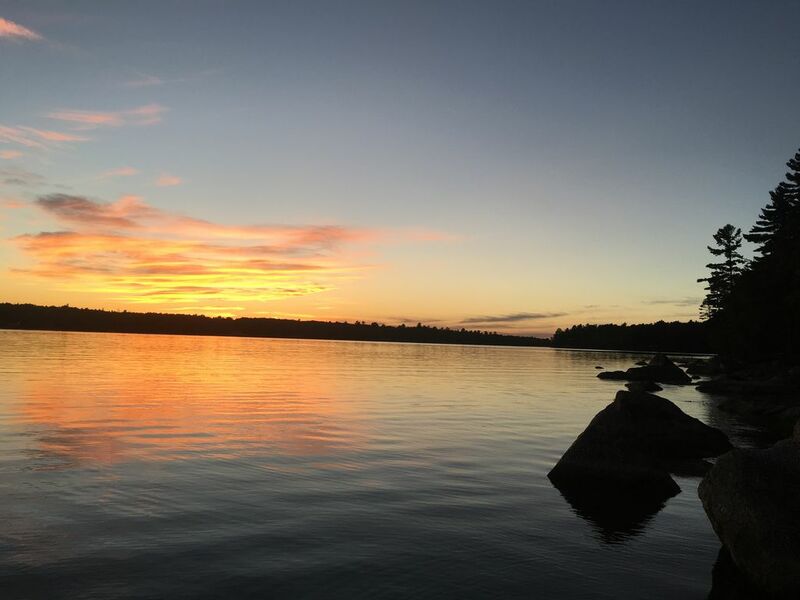 We appreciated beautiful Toddy Pond and the fact that Toddy Haven offered such terrific views, great wildlife watching, and a super convenient location to all kinds of activities in the area. Thanks to Mark and Laurie for providing us with such a wonderful spot to unwind! It was great to host Jennifer and her husband. They were the perfect guests, great communicators, left the cottage just as clean as it was when they arrived and we would love to host them again. For any hosts considering them, we highly recommend they make room for this lovely couple. The location is beautiful (be ready for some uphill walking). If you are lake oriented and bring a boat, I can't imagine a better spot. The dock is outstanding, and there's enough space for small kids to go in, too. The cottage is older, but has a nice kitchen and porch. It even has some nice touches, like the windows that open and make it almost like being outdoors. The additional bunks in the shed are perfect for older kids who want to be on their own. If there's a drawback, it's the rather spartan bathroom. But it's functional, and there's plenty of hot water for showers. If you fish or kayak, you'll have a great time. We enjoyed our stay and hope you'll enjoy yours, too. So glad you enjoyed your stay at our cottage. We love it here too. Glad you enjoyed the dock and kayaking on the lake. Fishing is really this time of year. You were great guests and left the cottage beautifully clean on your departure. You are always welcome at Toddy Haven!! Toddy Haven is the perfect Maine away! We enjoyed swimming, kayaking and generally relaxing on the nice dock. Sunsets and night skies were gorgeous and it was all even better with the loons calling. The cabin is very well organized with everything we needed. It's super clean and the layout is quintessential Maine with large windows that open out onto the porch. We spent a lot of time on the screened in porch and just found the cabin to be very cozy and comfortable. From the kitchen to the kayaks, Mark and Laurie have thought of everything and are very considerate hosts. The location is also close to shopping in Bucksport. We definitely recommend this cabin. Mike and Kathy were just perfect guests! They kept in good contact with us and we’re just all-around lovely people. They left the cabin and spotless condition and we would count to privilege to have them back for a visit anytime. So thankful they chose Toddy Haven for some rest and relaxation. Very tidy and clean. Lots of space and comfortable beds! We very much enjoyed our stay at Toddy Haven! Loved the pond so much! Looking forward to going back! Thanks for the great review! Thanks for leaving our cottage in such great shape on your departure. We would love to have you back anytime. Glad you enjoyed your stay. Had a great time at Toddy Haven. Mark and Laurie are great host. We enjoyed watching the fireworks from the dock. They were going off all along the lake. Would definitely stay again! It was a delight to host Tina and her family at Toddy Haven. They were communicative and considerate and left the cottage in spotless condition. We would count it a privilege to host them again.